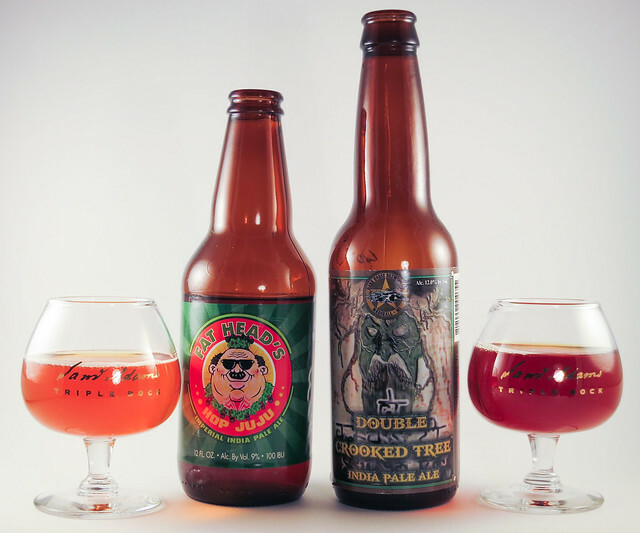 Based on the original India pale ale (IPA) style that was revived by the American craft brewing movement in the 1980’s, the newly minted ‘double IPA” (also known as “imperial IPA”) seeks to take both alcoholic strength and hop intensity to new levels. In late February two double IPAs appeared in our local beer stores simultaneously. One is a newcomer to stores, the first bottling of Fat Head’s Hop Juju. Regarded by locals as a world-class DIPA, as exceptional a double as Headhunter is a traditional IPA. Hype was palpable. The second beer is old-school as far as the imperial IPA scene goes. Having been released in 2005 as a hop bomb with 98 IBUs and a massive ABV of 12%, it represents all the brashness and swagger of the team at Dark Horse.